Polish companies had no capabilities to adapt swiftly to new environment (product competitiveness, marketing, finances), Government industrial policy did not exist. Given the above circumstances a group of twelve MANAGERS of the automotive sector, being HEADS of finished goods and subcontractors' plants, decided to set up employers' association. The major objective of the association was to protect global interests of the industry and associated members and to stimulate adaptation processes to the market economy. to authorise Zbigniew Prus, Krzysztof Rozenberg and Andrzej Tyszkiewicz to represent the Founders of the Association during the registration process of the Association. On December 21, 1992 the Association was entered under No ZP 25, Section A into the employers' association register, kept by Provincial Court in Warsaw, 7th Civil and Registration Department. The Association operates under the Employers' Organisation Act of May 23, 1991 (Dziennik Ustaw No 55, item 235) and under Association Statutes. 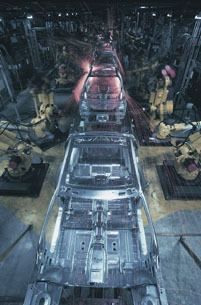 In October 1994 the General Meeting of Members replaced the previous name of the Association with "Automotive Industry Employers' Association". The operational area of the Association is the territory of the Republic of Poland. The seat is located in Warsaw, 34 Targowa St. room 62, phone +4822 618 47 33, fax +4822 618 49 05. Major statutory task of the Association is to protect rights and to represent interests of the associated Members vis-a-vis employee trade unions, authorities as well as central and local government bodies. enhancement and acceleration of adaptation processes to new market environment. Association Office, Industry Specific Teams and Work Groups, being a part of the management structure. To meet its statutory goals the Association is allowed to run economic activities, set up foundations and funds and to get involved in other economic undertakings. The Association funds its activities through membership fees. Member of the Association may include a domestic natural person or domestic organisation, which aims at running business activities in the automotive industry, employs, at least, 100 workers, has its corporate seat or a plant within Association operational area. Automotive industry in the understanding of the Statutes is the activity comprising manufacturing and sales of automotive industry products, activities of design offices and R&D facilities working to meet motorization requirements. Membership in the Association is voluntary and does not limit the independence of Member's activities, however, the Member of the Association may not belong to any other nation-wide industry employers' association. The above restriction does not apply to parallel membership of the Association Members in regional employers' associations.